It seems these days that everyone has a blog (or two). There are big news blogs, little blogs with useful articles (such as the many C# blogs I read), the countless teenagers with MySpace or livejournal blogs. There are blogs about tech, politics, clothing… there are even blogs about blogging! Even I have been sucked into the blogging scene. Even my Xbox 360 has a blog. So why shouldn’t my hedgehog have a blog? So that’s what I did. Right after we got Pliny and got him set up with a nice cage and a big wheel, I started thinking about how I could get him to blog. I thought about teaching him how to type and operate Wordpress, but as cute as he is, he’s not very smart. So I took the technological route. I built a little sensor out of a magnet and a reed switch and attached it to his wheel. After about 4 months of on-off (mostly off) C# coding, I had a client built up that would poll the sensor, log Pliny’s wheel activity, and post to his blog. The Hogblog was born! It posts his activity, along with charts and occasionally a pic from Flickr. It’s all automatic, and I’m subscribed to his RSS feed to find out just how much running he’s been doing while I was asleep. It’s already brought up some interesting information. 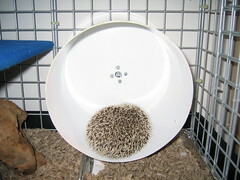 For two days his wheel was stuck - the little log he sleeps in was jammed up against it. In the two days since he’s run almost half a mile! This has been a really fun project that has tied together a lot of fun aspects - playing with physical elements like the sensor, coding in C# (and interacting with the parallel port to get the stats! ), and making web services calls to Wordpress and Flickr. I’m already thinking up more ways to improve his blog, but for now I’m going to sit back and watch for a bit!